A little fun paper craft if you're looking for something easy to do with your toddler or need some Mother's Day flower decorations. We made these dyed coffee filter sunflowers for decoration for Ashlynn's Frozen Fever themed birthday party. You could dyed the flowers any color or use mess (and stain) free "water colors" by having your child color the filters with markers then painting them over with water and brush. We used a large tupperware container and added a bit of water, about a 1/2" full and added a few drops of food coloring. We dipped them in a few at time and placed them on some paper towels to dry. Beware the food coloring will stain, so prepare and protect your area and clothing if kids are helping. After letting them dry out overnight, fold them in half four times (shown below). Similar to making paper snowflakes, cut the folded filter into the shape of a petal. 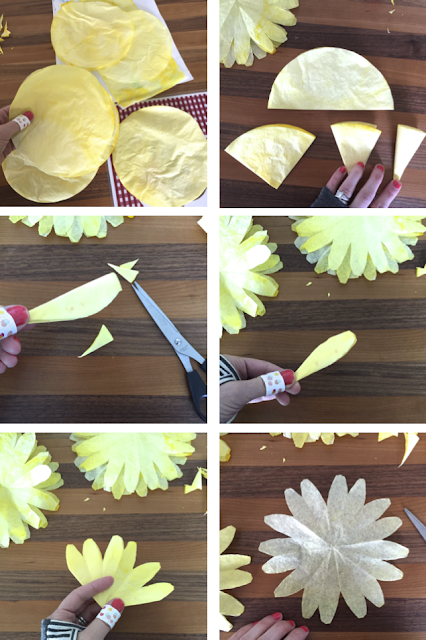 I would cut three at a time since we made a bunch, but you can have your tot follow a line with safety scissors. Ashlynn tried, but since she is a lefty her righty scissors didn't work too well so I did it for her. After cutting, I let her unfold the flowers and they we layered them together by brushing modge podge into the centers. We layered three together setting the petals off center to give the flowers a fuller look. 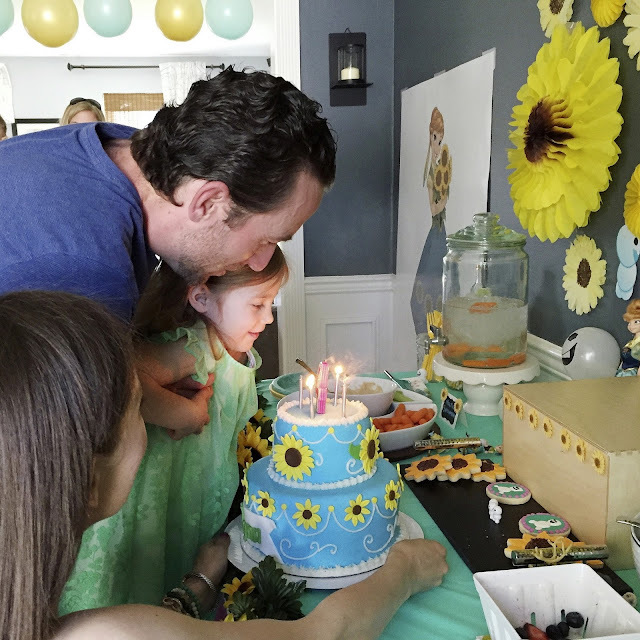 Since we wanted sunflowers to match Anna's birthday dress and decorations, I used a q-tip and some brown acrylic paint to paint the seeded centers. Markers, crayons, or gluing constructions paper to the center would work just as well. And that's it! You could make a garland for a mantle or even lay them over a table cloth as a table runner. The best part was we had everything on hand so this was a FREE activity that doubled as party decor. 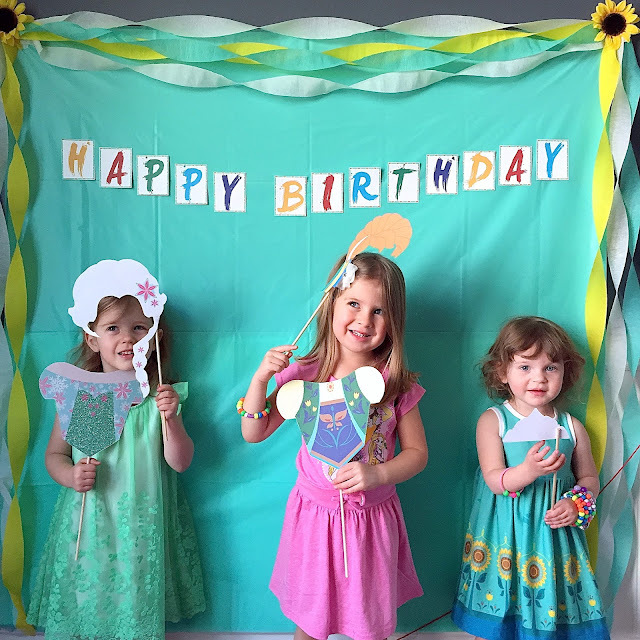 Do you have a favorite easy and free craft you do with kids?? 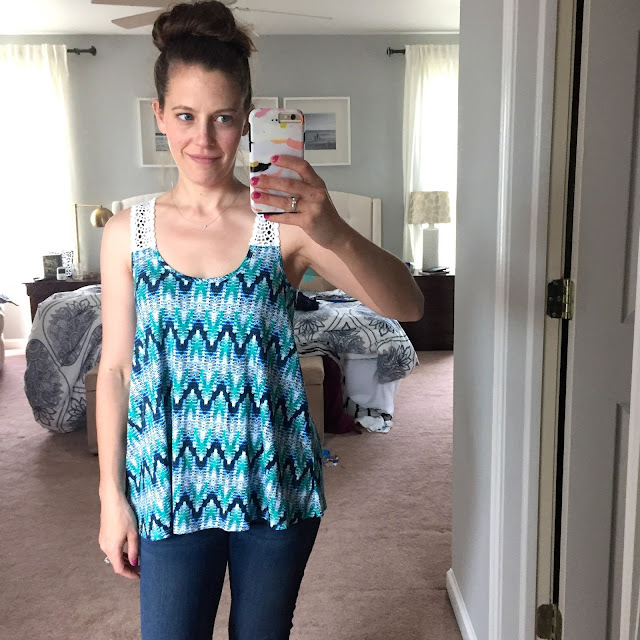 It's been close to 6 months since my last Stitch Fix, if you remember, I was less than thrilled with my fix and have slowly been losing interest in the service. I find the majority of the items' quality doesn't match it's price point. 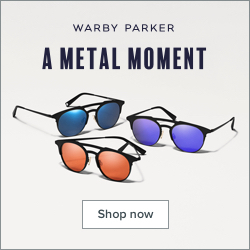 A lot of times, I'll receive something that I would buy, but know I could find something similar for less elsewhere, sometimes in better quality. I also have really been getting tired of the plethora of mixed material and surprise back tops. I feel as if I can spot someone wearing a Stitch Fix item a mile away due to the back of their shirt. Still, I have a handful of items I've kept over the last two years that I really have loved and have held up well. 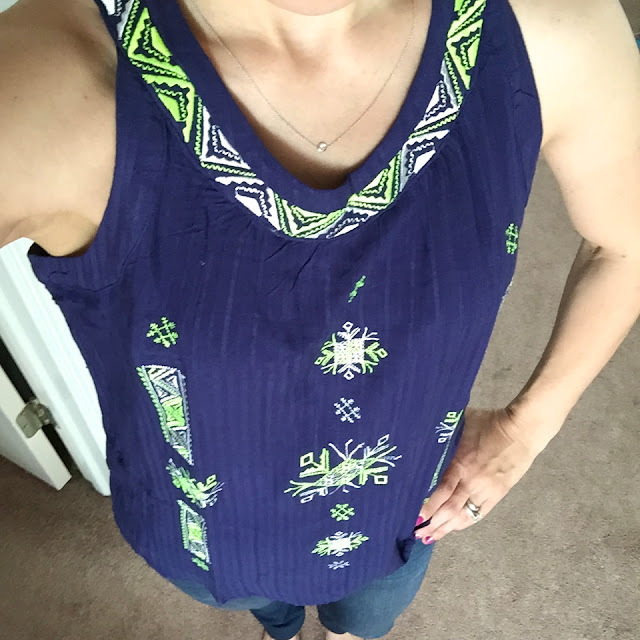 Then there are a few that unraveled or crazy shrunk in the wash.
After pushing my Fix back twice, I finally decided I'd have it ship now as I'm in major need of casual spring/summer tops. 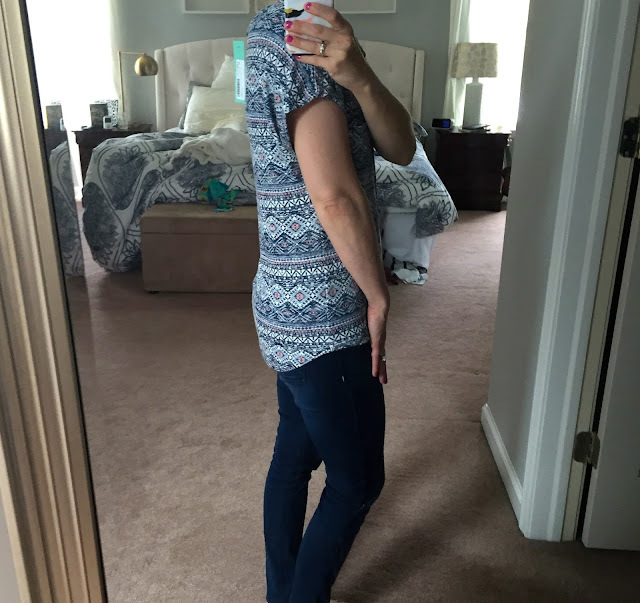 I wrote to my stylist requesting no shoes (I know it's their new thing and they've been sending them to everyone), and tops only. That I wanted something I can wear while running errands with the kids and still feel like I dressed myself for the day. 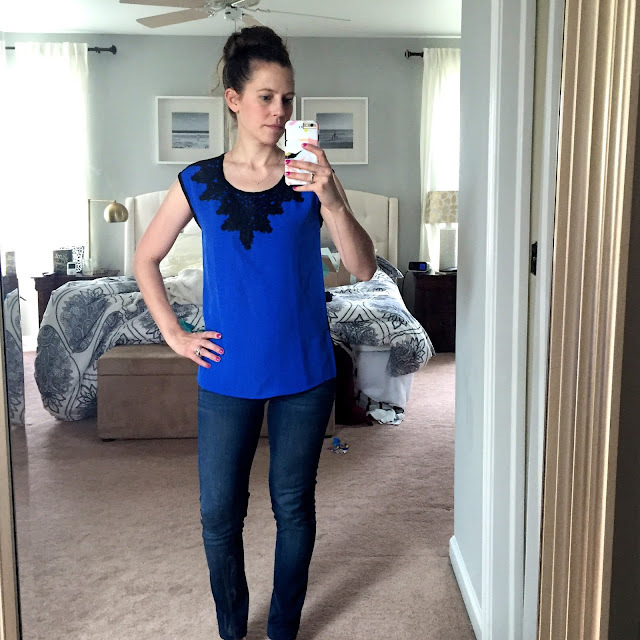 I requested natural fabrics, cottons vs polyester, and that I was looking for preppy or unique tops similar to what I could find at J.Crew or Anthropologie and referenced my pinterest board. Generally, I am not a fan of chevron print. It's just been dead and feels super played out. 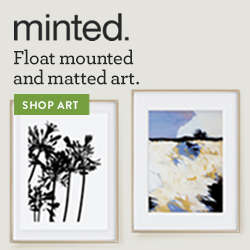 I do like blue, green, and white, but something about this less than thrilled me. I guess I felt it looked cheap? 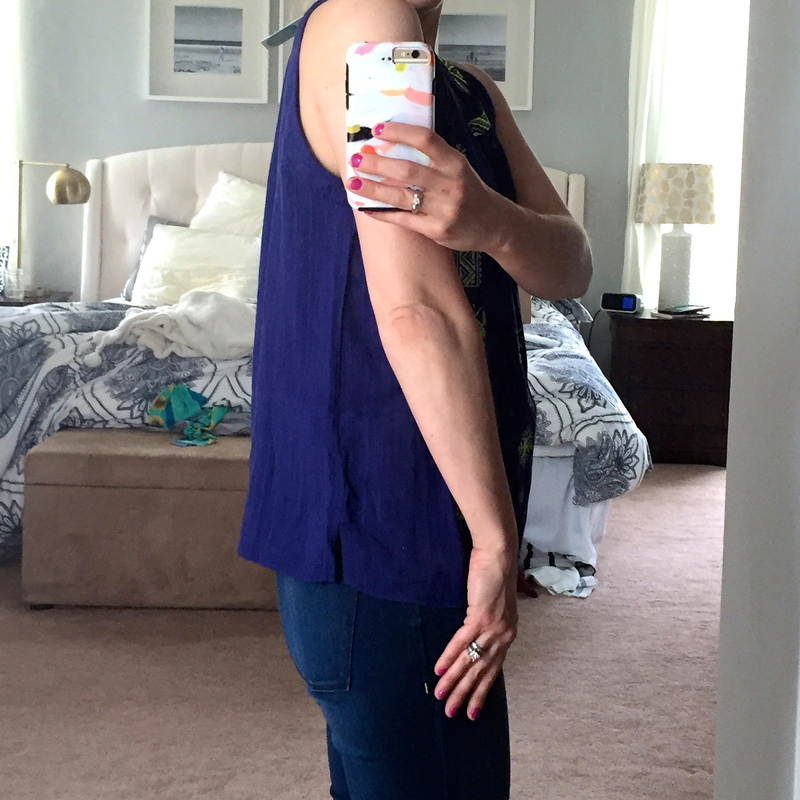 It's 95% rayon, but is breezy and would be nice with shorts running around on a summer day. 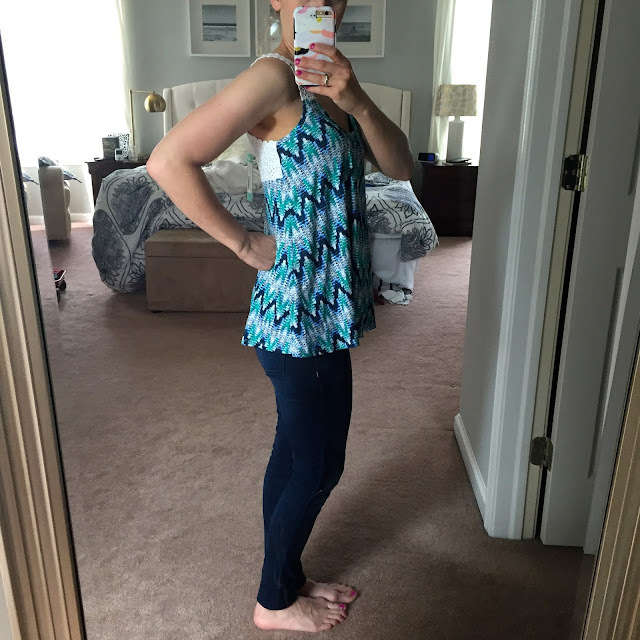 Once again, I didn't really find it worth it's price, but I did think it had a flattering fit. 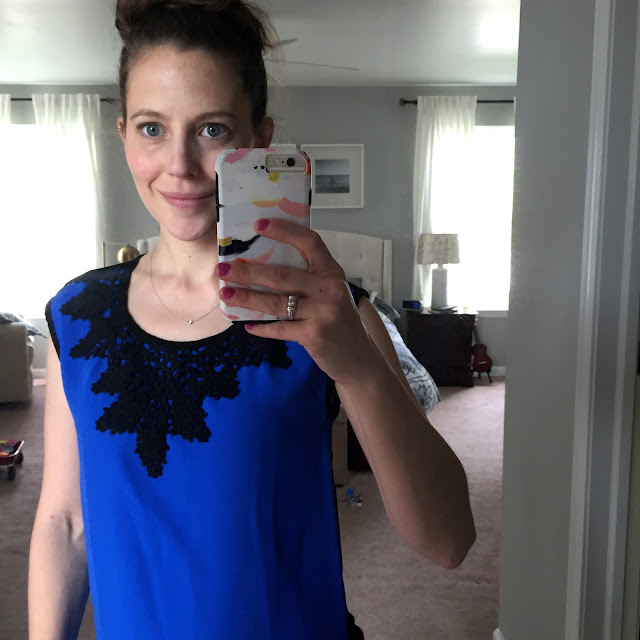 I had requested a similar blue lace top I had seen in someone else's fix. Heather said it wasn't available, but that this was similar. I'm probably one of few women who rarely wears black, but that killed it for me. The fit was okay, I love the royal blue, always been a favorite color to wear because I feel like it makes my eyes look bluer, but I wish the back was blue, not black, and the lace white. It reminded me of something I would have picked up at The Limited or Express back when I worked and paired it with black Editor pants. Just doesn't really fit my current style. Ugh, ok... yes, this shirt is basically all the things I'm tiring of with Stitch Fix. Mixed materials, surprise backs, overpriced polyester, and chevron. But but but, I kept it. Only because I had a credit and I hate paying for the styling fee and not getting anything out of it. Without the styling fee, I probably would have returned it all, but it was "free to me" so I kept it. 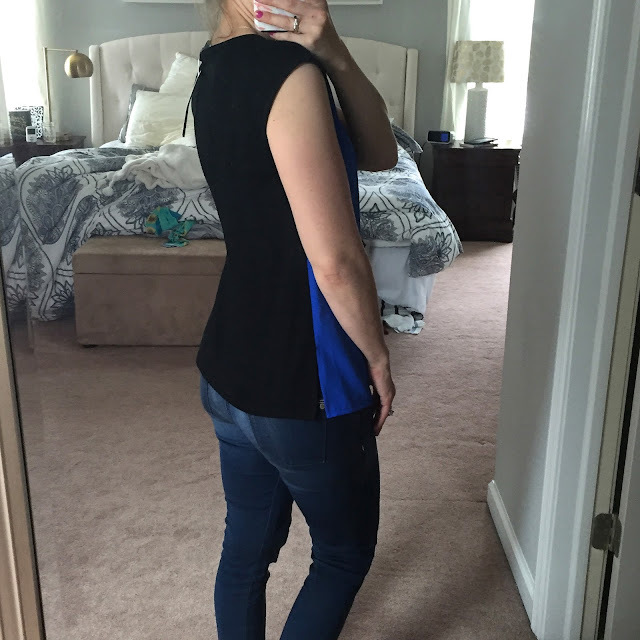 I love the fit and length in both the front and back. 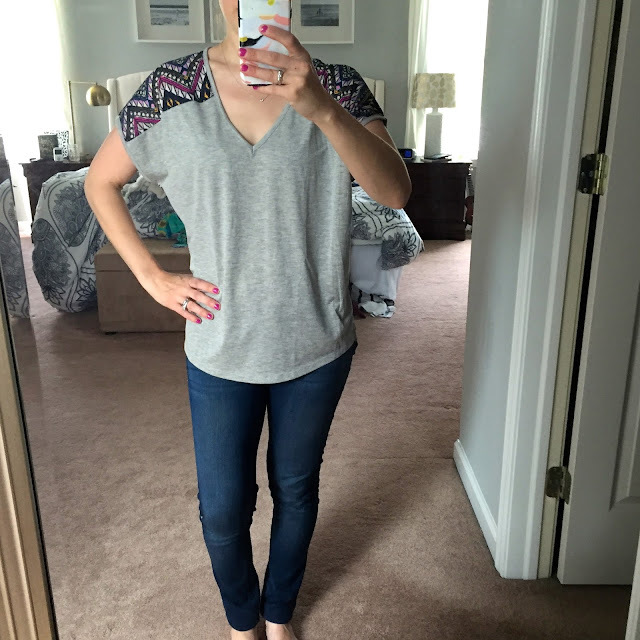 Grey v-necks are definitely a go to, and while I'm not crazy about the pattern, I don't hate it. It's definitely a shirt I can throw on and go. 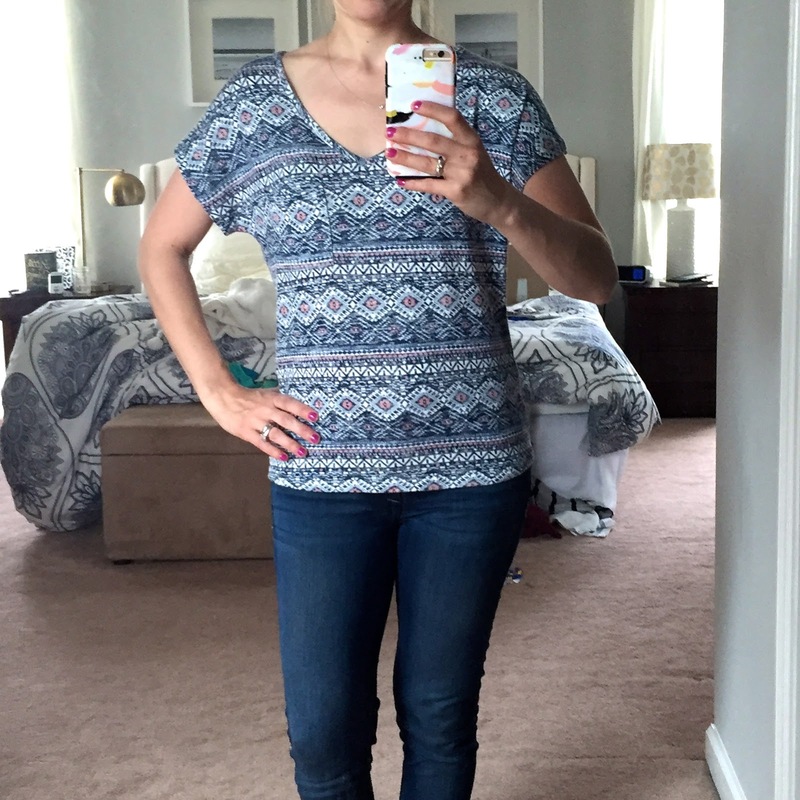 So yes, I totally went back on my word above paying $44 for a v-neck tee. I think I might put my fixes on hold for a while. I definitely tend to like their winter options, blouses and sweaters, better than the tops. I also think I need to be even more specific in what I'm looking for and possibly try to request specific SF items. Please prepare for photo overload. 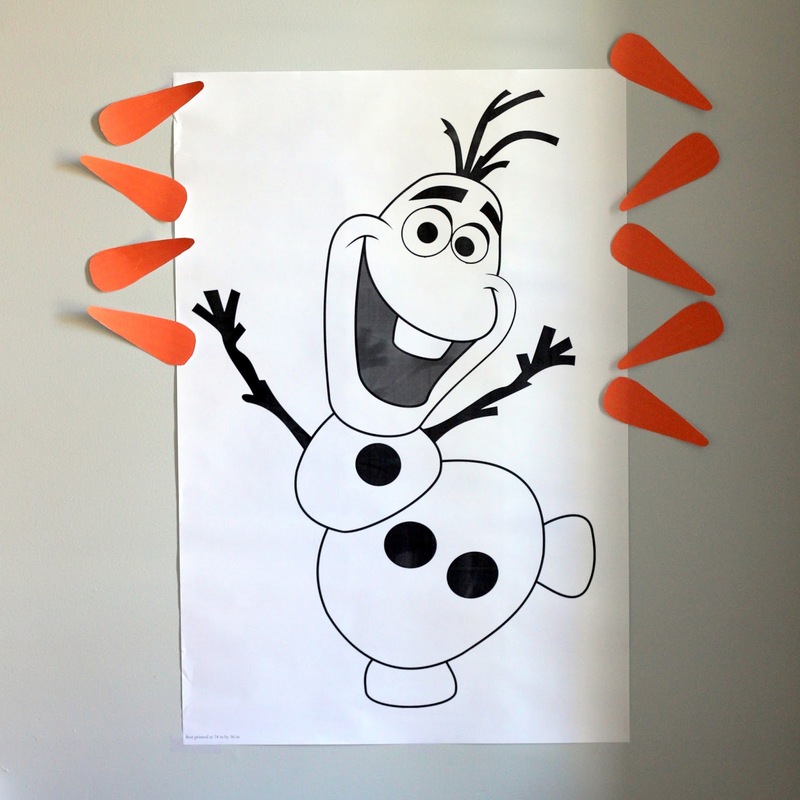 I figured I'd just make one big old post so if any of this makes it's way to Pinterest it's all in one spot for those who've been requested for similar Frozen themed parties. 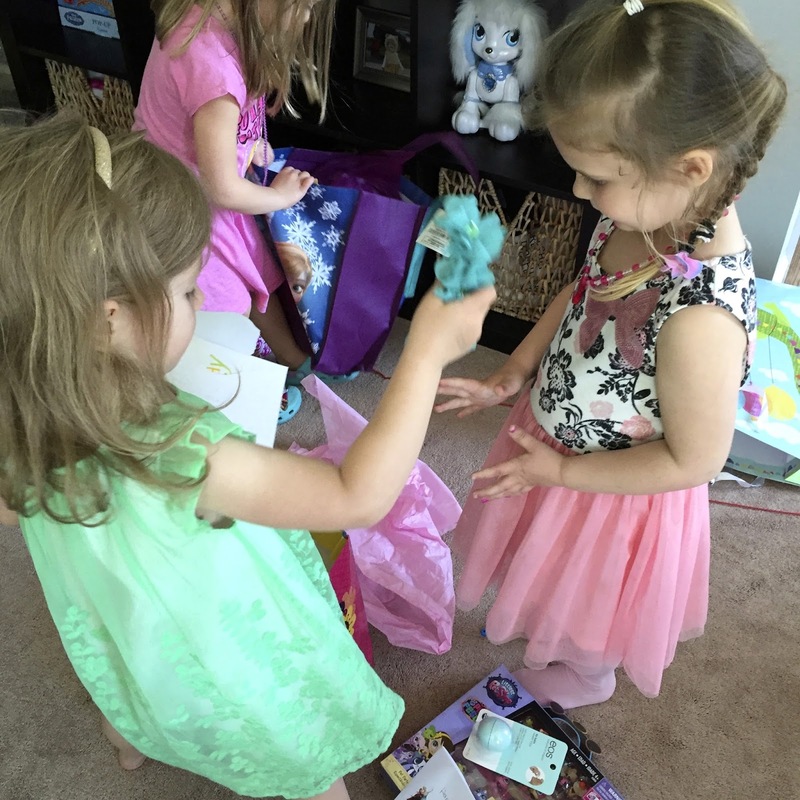 Ashlynn had initially just asked for a Frozen party, but since she has a spring birthday, I talked her into Frozen Fever. 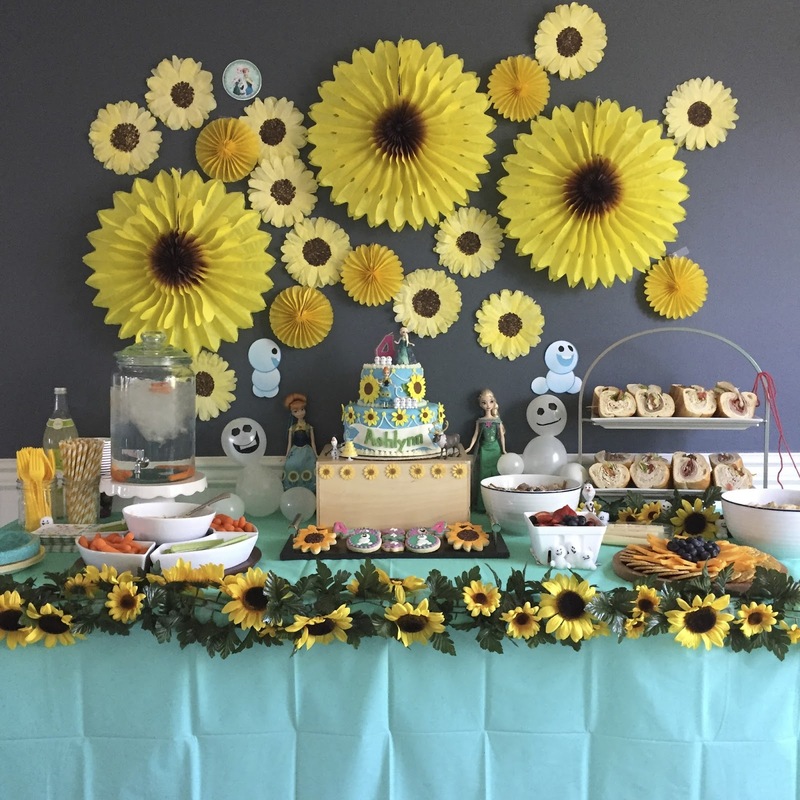 I figured it'd be easier to use sunflowers and the movies' birthday party theme. Knowing Ashlynn can be overwhelmed in large group settings and I knew I wanted her to enjoy her birthday relaxed and happy. 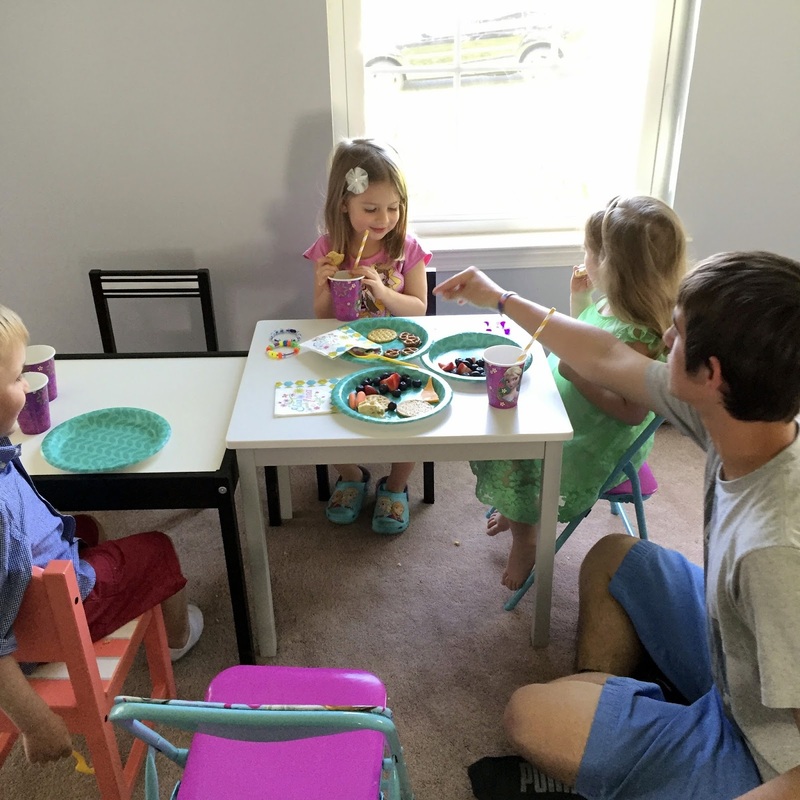 So we nixed the idea of going to the local trampoline park, bounce zone, and her gymnastics gym with her whole class for a party at home with her cousins, our close local friends including a friend from school and a friend from gymnastics. 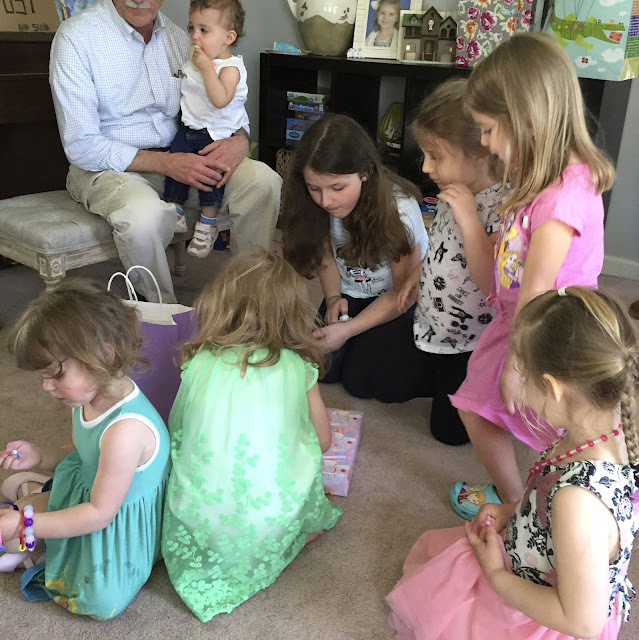 It was just the right amount of kids in the house (10), but since they were mostly over 3, I knew we needed some activities to keep the kids from getting crazy or getting bored. I decided to take the Frozen Fever theme past just the decorations and cake and interpret the movie (more like music video) into the actual party. We had a string tied to the door and it literally wrapped around our house with different activities for the kids based on all the gifts Anna collects from Elsa. Of course, the table was the star of the party, I mean don't people just come to parties for the cake? ;) Some cheap yellow and sunflower paper fans and an easy DIY project that I did with Ashlynn one afternoon to make the rest of the sunflowers for the backdrop. I'll share more on those another day. I ordered the cake from a pledge sister of mine who now has her own cake business. 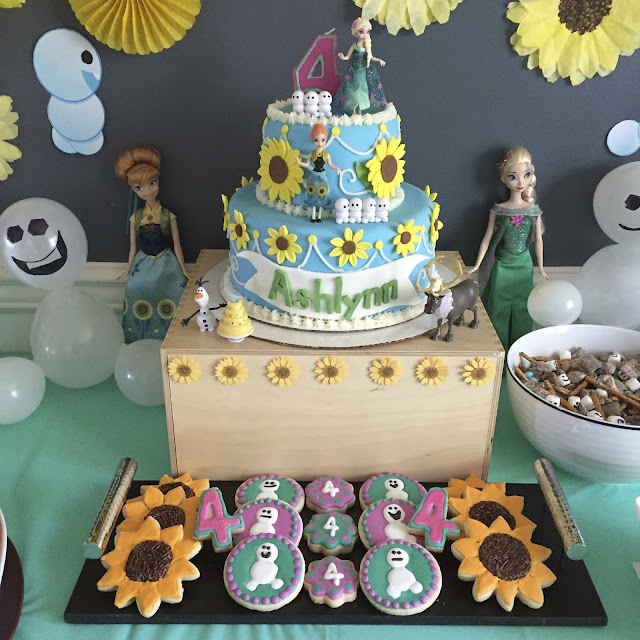 I typically would have made a cake or cupcakes myself since it's a huge savings to do so, but Ashlynn was really excited about her birthday cake, and I just knew we had to thee Frozen Fever cake and there was no way I'd do it justice. Some Frozen Fever toys doubling for decor and kid friendly snacks and we were all set. I did manage to make some royal icing cookies, sunflowers with chocolate jimmies for the centers, some snowgies and number 4s. Variety of hoagies for Anna's love of sandwiches, and cheese that resembles the Rapunzel flower more than a sunflower, but I tried. And 'Follow the String" string cheese for kids like Kenley who only eat cheese sticks. The melted snowman water cracked Ashlynn up and was way easier than making a punch. ;) The little pom pom snowgies you see hiding around the table were made with craft store pom poms, hot glue and black puff paint. We gave them out to the kids as they left. I brought down the kid tables, Ikea Latt and Ikea Kritter, and set up a bracelet making station for the first activity. Since Anna's first gift was a bracelet, I thought this would be a good way for the kids to "break the ice" since children can typically be shy when entering a party. The girls loved beading the pony beads on the plastic bracelets and it was a great way to get everyone involved right away as they arrived. After, we moved the tables aside to play a game of musical chairs. Ashlynn has played at school and I know it's a favorite. Naturally, they dance around the chairs to "Making Today a Perfect Day". 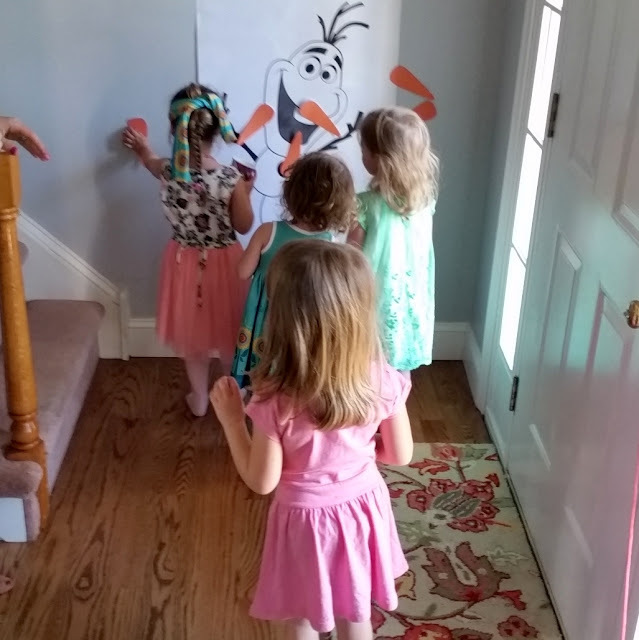 We also had a great game of Pin the Nose (Carrot?) on the Olaf. Not sure if the kids have been blindfolded before because they all thought it was the funniest thing. The string had gone to Oaken's Trading post, where everyone could have gotten a Frozen tattoo, but the excitement was too much and the kids were all having a good time. No need for extra activities if everyone is content. 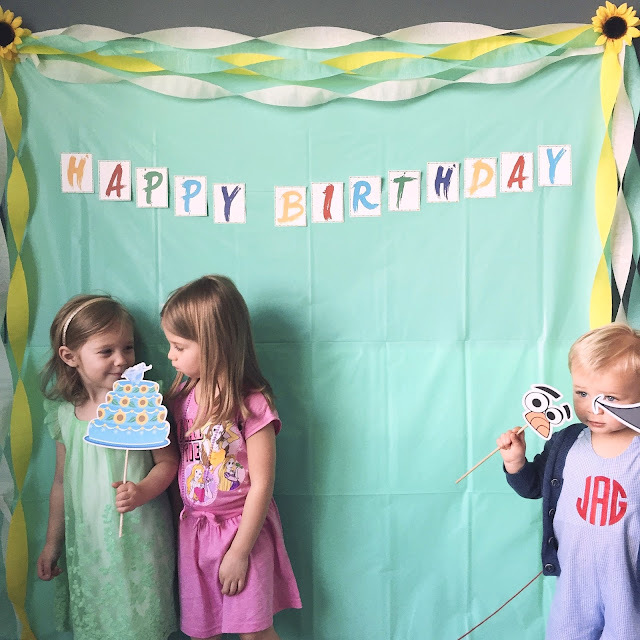 The string then rounded into the dining room to the kid sized photo booth (kid sized being extra low backdrop) for some silly pictures with some Frozen Fever printable props. If you're still relating games to gifts, this was inspired by the portrait Anna receives. The string ended at the platter of sandwiches everybody filled up and after we all sang Happy Birthday and cut the cake. Which, if I haven't mentioned, was amazing. The top tier was purple vanilla cake, a big surprise for the birthday girl, and bottom chocolate chocolate chip cake. After we opened presents always a highlight for the kids. 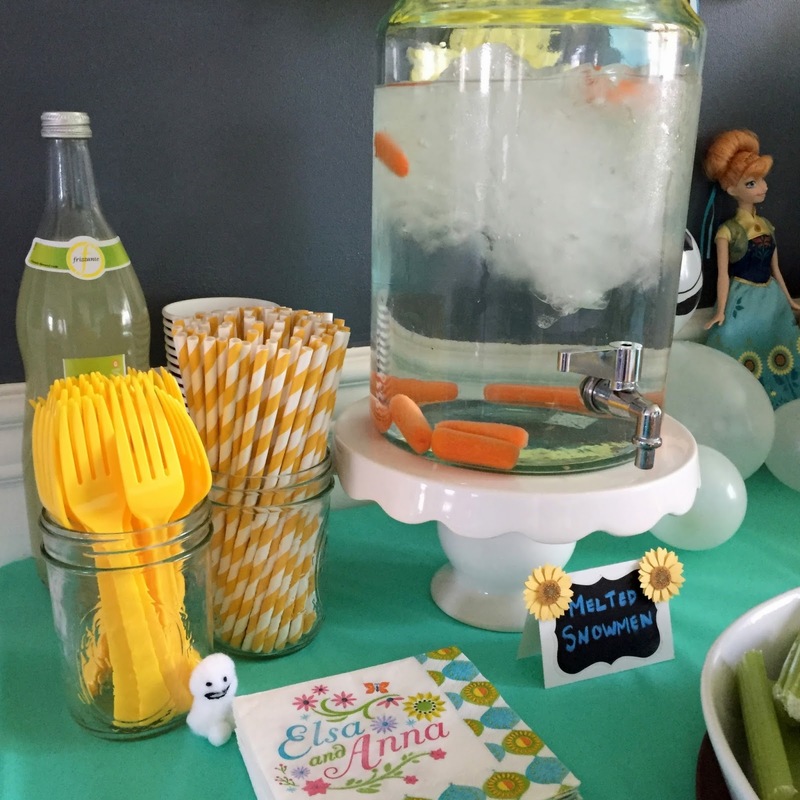 When coming up with ideas for Ashlynn's Frozen Fever Birthday party, I was trying to devise a plan to turn each of the gifts Princess Anna receives in the short into an activity for the party. 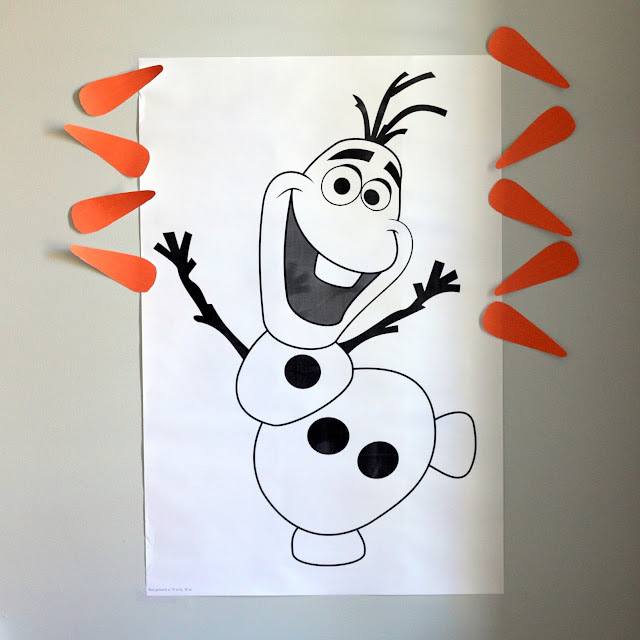 I searched Spoonflower for Frozen Fever inspired fabric prints so I could make a blindfold to mimic the socks. I was initially just looking for a sunflower pattern, but when I found actual prints from the movie I knew I would order more than just enough to make a blindfold and hair bow. They were running a 50% Off special on 1 yard or more of modern jersey material, which brought it down to $13.25. 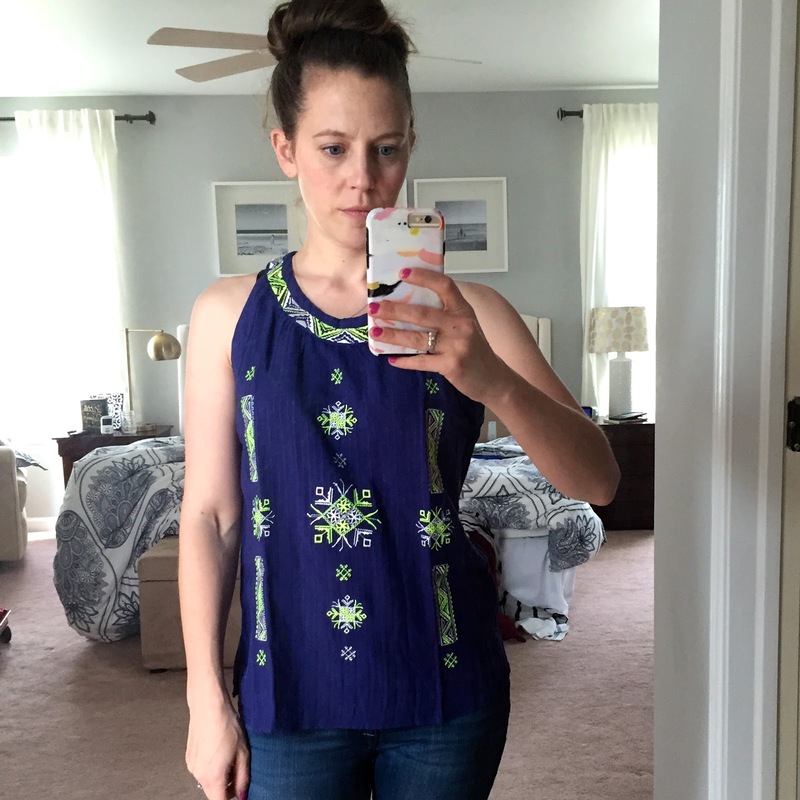 I was a little hesitant to order jersey knit since I have never worked with it before and I know it can be more stubborn than basic quilting cottons. I also don't have a serger machine, so I was hoping my edges would be finished enough with just an old school zigzag stitch. A basic cotton is still roughly $18+ on Spoonflower, so I just thought I'd give it a shot since it was my cheapest option. I searched Pinterest for jersey and dress patterns for knits and found this FREE swing dress pattern from Craftsy. It looked simple enough, and truly it was. I was able to get a size 3T dress and blind fold out of the yard, and still had a little material let over, but mostly scrap. 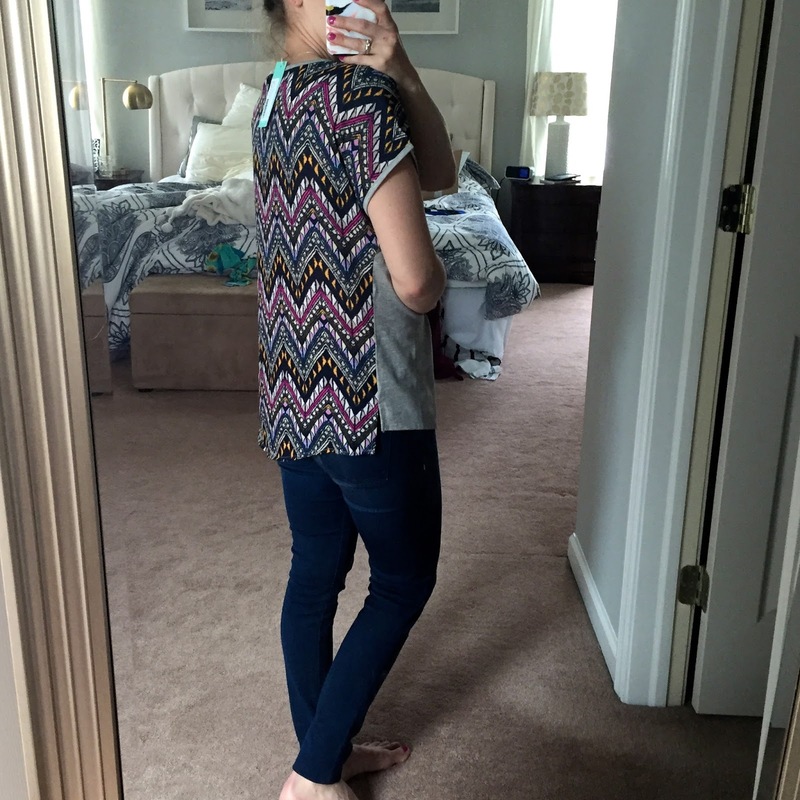 To be honest, this might be my favorite sewing project to date! I am so proud of my hem lines matching, the knit ribbing collar and arm holes, and getting the edges to lay flat at the shoulders. The best part is Kenley (our Anna to Ashlynn's Elsa) wants to wear it all the time! The jersey material is lightweight and comfortable, it would make a sweet nightgown too. Since she wanted to play for the rest of the night after we tried it on, I didn't get to hem the bottom up until later, but it was done in time for the party. I definitely would like to make a few more of these dresses for the girls since they are perfect for summer. 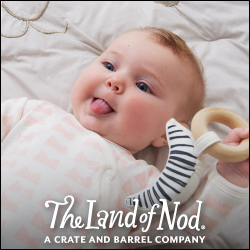 They wash easy and are super comfortable to play in. Once I get all the pictures together, I'll share all about Ashlynn's birthday party. Today is her actual birthday, so we are going to try to make it as special as her party was, but it might be tough to top! I hope everyone had a great weekend! - Downton Abbey. Yes, from one period piece drama to the another, after enough recommendations from friends to watch the masterpiece classic, I gave in after learning the seasons are short. I'm already into Season 3 and it's only been two weeks. Unfortunately, I found some spoilers while googling characters. I have a terrible habit of wanting to learn more about the actors (what else they have been in) or wondering something as silly as what their ages are supposed to be during the show. Of course this usually leads me down a path of coming across something I wish I hadn't. So far there are few things that have been 'new', but I have a feeling I know the biggest plot lines. Hopefully, I'll it won't matter and I'll still love the show as much as everyone else without things being shocking. So far, I really do like it. 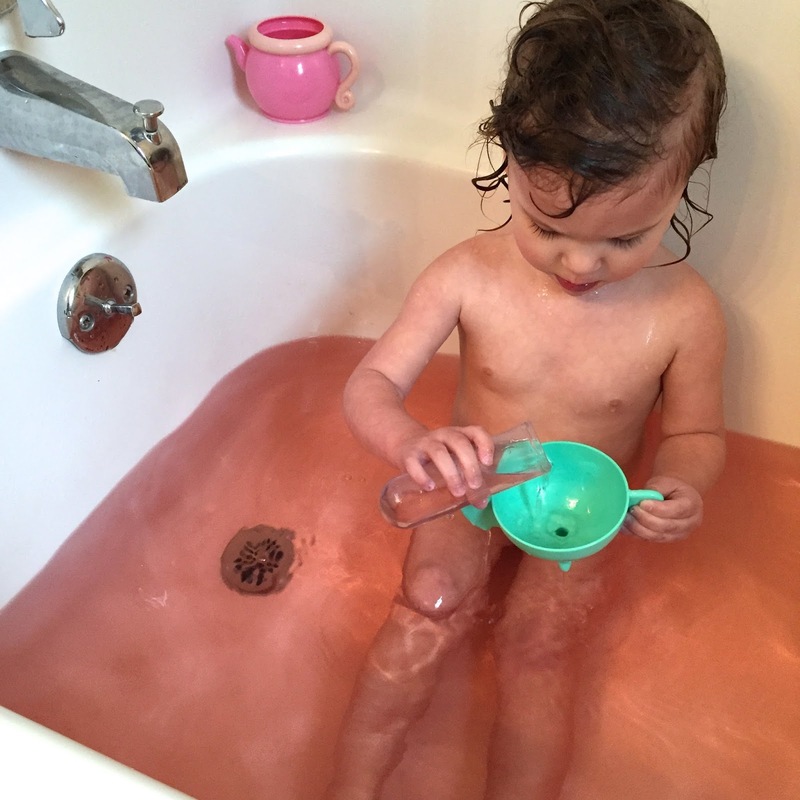 - I've shared some of our bathtime fun on snapchat and insta which includes our Crayola Bath Dropz. I picked them up on a whim a few months back, and we now have colored water for all our baths. Aside from leaving some water colored spots behind on the tub (from splashed water, but washes away easily), we are pretty obsessed. I'm not a huge fan of bubble baths since it makes it hard to rinse the girls hair of shampoo and conditioner because it always seems like it leaves bubbles behind. And they aren't a fan of getting their hair rinsed out in the first place. Not mention Kenley freaking out that there are still bubbles on her legs and feet when she is ready to get out. So basically, this is just as fun, but less messy. It doesn't stain the girls skin and is washable when splashed and left behind. - I saw this morning that the KidKraft kitchen the girls have is on Zulily, and the white version is just over $100. Usually the white one is more expensive, so if you've been looking, we love our play kitchen and it's held up great in the three years we've had it. Highly recommend! 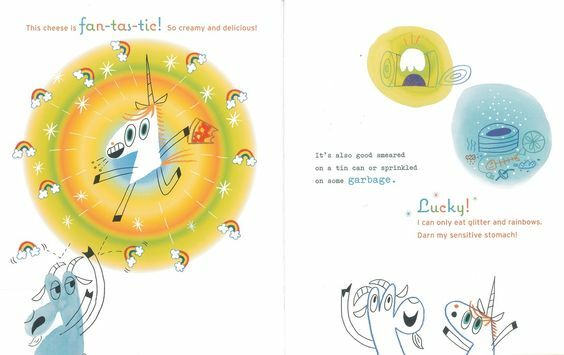 - Our new favorite book of the week is Unicorn Thinks He's Pretty Great. This is definitely a book the readers will enjoy as much as the listeners. Goat gets jealous when Unicorn shows up and start showing off all the awesome (and hysterical) things he can do, like make it rain cupcakes. But it isn't until Unicorn comes over to befriend Goat and is in awe of his ability to make goat cheese pizza. An unlikely friendship ensues and shows we shouldn't be so quick to judge or be jealous of others' talents when we have so many of our own. - Yasso Greek Yogurt Pops. At about 100 calories a pop, I attempt to control myself to eating one a night. Seriously, every flavor is really good, see if you can find them at your grocery store. - And finally back to bathtime, I previously wrote about how much we enjoyed SoCozy's "Boo" line of hair products and I was so thrilled again when they reached out about sending some new products for us to try. The 3-in-1 shampoo, conditioner, and body wash suds up great and lets us skip a step in doing a separate conditioner, and more importantly, another rinse. The Mango-go scent smells so good, and I can still smell it on their hair after a few days of skipped baths or hair washing. And like all the So Cozy products there are no parabens, sulfates, phthalates, formaldehyde, synthetic color, propylene glycol and is free of gluten, wheat, and nuts. We have been using the coordinating fruity tutti detangler + leave in conditioner in the morning and it's been perfect for undoing bedhead messes. On a side note, our Educational Insights GeoSafari Science Kit has made the best bath toy. 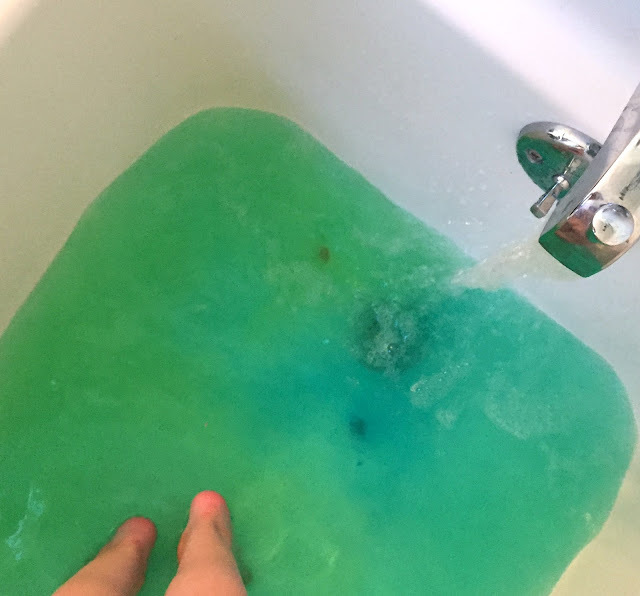 It keeps me from having to deal with the mess of toddlers and science experiments in the kitchen to actually letting them have something different for them to play with in the tub. Annnndddd, it's 75% off on Amazon right now, I would highly recommend grabbing one because for $7.46 it'd make a great birthday present or gift for classmates or even collections like Toys for Tots. And that's it for now! What's on your current love list?? ?